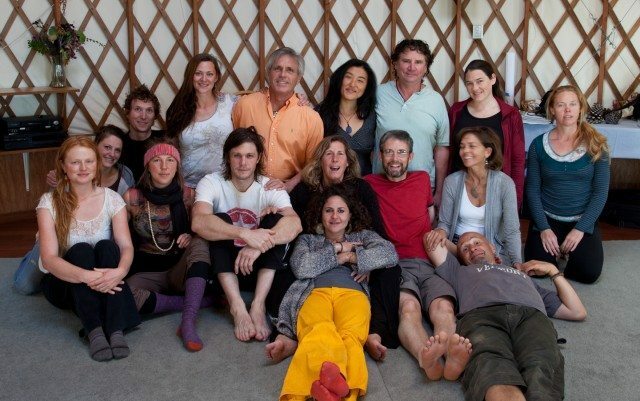 Just got this photo of the group I worked with at Esalen over this last month. Taken at Porter’s Yurt where we worked, high above the Pacific, it includes (from left) Daphne, Nikki, Lars, Rio, Jamie, Peter, Isabel, Jane, BanghHan, Thomas, Geno, Alicia, Marie-Jorge, and Nicole. It was great to work in the loving embrace of Esalen, and great that these folks showed up ready for deeper healing, a kind of work I don’t get to do in my usual ‘professional’ workshops. Peace, love, and tie-dye to all of you spiritual travelers, now dispersed back to the seven countries you represent, or staying there in the waves of people that wash over Esalen and leave with scarcely a ripple – unique place. Long may it wave!